In the southeastern United States, with the warm temperatures and high humidity, there is a growing problem with algae on roofs and particularly asphalt/fiberglass shingled roofs. This algae known as Gloeocaps Magma which is identified by the brownish black streaks seen on the shingle usually appears on the north side of the house first. This is where there is the least sun and the most moisture. With a warm moist surface, the only thing the algae needs is a food source to grow and spread. The food source is limestone. Shingle manufactures add a crushed limestone mixture to the asphalt fiberglass shingle mainly to add weight. With the high cost of petroleum used in the asphalt, the manufactures needed to find a cheaper way to make the shingle so they introduced fiberglass. This reduced the asphalt, but also made the shingle too light. Therefore the relatively cheap limestone was added. Now the question becomes, is the algae a problem or just an eyesore? Not only an eyesore, but Gloeocapsa Magma in some extreme cases left untreated can become a health issue to some with chronic breathing and allergy problems. But in general, the algae will just continue to grow until the entire roof is covered. With the roof granular covered with algae, it inhibits the ability to reflect the UV rays of the sun. This in turn causes excessive heat build up in the attic which not only causes higher cooling costs, but also increases the deterioration of the shingles. In its early stages, Goleocapsa Magma is more of an eyesore, but as it grows, it can become a significant problem. The best advice is to have it removed by a professional roof cleaning contractor when it becomes unsightly. Taskmasters uses a No Pressure technique approved by A.R.M.A. 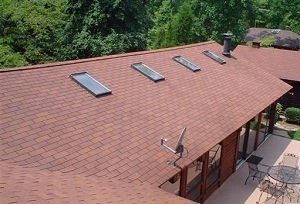 (American Roofing Manufactures Association) to remove the algae safely without damaging the roof. Give us a call with any questions, we love to help. If you're looking for a professional roof cleaning contractor in Pinehurst, then give us a call 252-266-9457 or complete our online request form.